Advance copies of my Draw It! Animals, the fifth in my Bloomsbury series, have just arrived. My postman entered into the spirit of the thing by camouflaging them in a shrub in the front yard while I was away. Luckily they didn’t mind the rain, and are still quite lively. Making a more public appearance this May 2015. 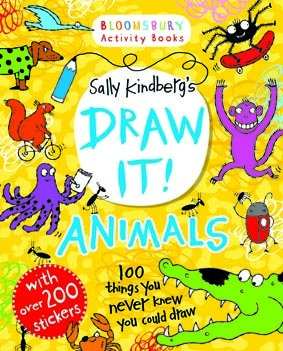 This entry was posted in Books, Drawings and tagged animals, Bloomsbury, Bloomsbury Activity books, Draw It! Animals, Sally Kindberg. Bookmark the permalink.